While too much of our news media is focused on the Middle East and on terrorism, we think little about the toys we buy our children, or the very consumer goods we use in life. What many of us seem to not know, or ignore, is the fact that the very things we use—such as iPads, galaxy phones, and our mobile computers—are made in part or in whole with child labor. In China, young people under the age of 18 are regularly employed to make the very things we use everyday and we buy in our nearest Walmart, Target and Costco stores. But it is a modern Dickensonian world we live in where children are viciously exploited for their labor, and are given killer schedules but for less money compared to adult workers. 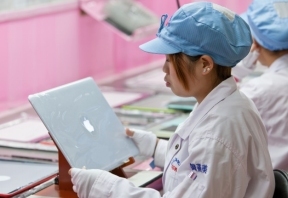 According to a report by China Labor Watch, children have been employed in HEG branch factories to make the parts that go into iPads and galaxy phones manufactured by the major corporation Samsung. HEG Technology is a state-controlled company that supplies parts for foreign companies like Samsung, Oppo, and TCL. What frightened me was seeing very young workers (clearly children) in a youtube video on an assembly line making iPads. HEG’s policy is to primarily hire under-age women and students in high school to make machine parts and even whole iPads that might cost the factory U.S. $5.00 to make. The child workers are barely given any training to do their jobs, and inadequate protection is given for these child workers (or for the workers, period) when they handle hot soldering equipment or possibly toxic or dangerous electric components. If this were happening in the United States or Canada, there would be major exposes on any and all American companies doing this practice. That it is happening in China does NOT excuse any American or foreign company from going along with this. Regardless of where anyone’s iPad or galaxy phone was made, the use of child labor or any country that practices the use of child or slave labor should never be tolerated. But until something is done, and more people in America and other First World countries protest enough, what will be done about the practice of using child labor to make the things we take for granted? !